Thakkyamanaung pagoda is situated half a mile far in distance from the eastern part of the palace site and it stands on the flat land. The pagoda was erected by king Thi Ri Thu Dam Ma in AD 1629. 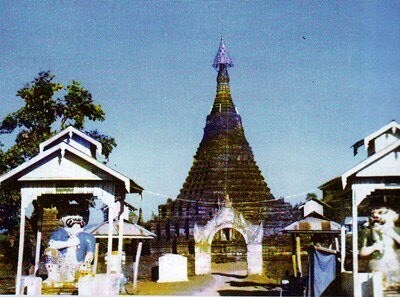 The pagoda was named Thakkyamanaung in commemoration of that Sakkya clan ruled the throne of Mraukoo consecutively from generation to generation. The pagoda is 240 feet in circumference and 114 feet high. The pagoda is surrounded by the stone wall. The figures of Tanawyatkha and Piliyatkha who are gurading the pagoda, and the figures of Vithajone and Pyinsathikha celestial beings who are playing obeisance to Buddha, can be seen at both sides of the western entrance. The pagoda was made of stone and it was built in the form of the sacred lotus. The form of booming of sacred lotus flower and the form of appearing of the pagoda from the plinth, represent that Buddha, the sacred lotus flower, appeared from the worldly realm, the mud. There are four porches in the two terraces. The porches were decorated with turreted designs. Every terrace has diamond corners. The great pagoda is surrounded by twelve small pagodas. Each ordination hall is at the four corners. Those ordination halls are 6 feet high. There is a big ordination hall in the east of the pagoda. 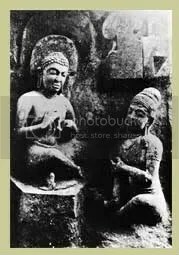 The Buddha images from that big ordination hall, are those which were brought from Pyaysoegyi pagoda in 1915 AD. There is still a Buddha footprint with 108 sole marks worshipped in Mraukoo period near the Buddha images. The board of trustee maintains the pagoda.